Length: 18' not counting the rudder. 18.5' counting the rudder. Beam: 10' with amas extended. 4' with amas folded. Condition: Excellent condition except for the following two items. 1) There are scratches where the amas rub against the hull while trailering. The majority of these scratches occurred the day I brought the boat home from the dealer. I suspect this is expected common wear, but I haven't ever discussed it with any other Island owners. Also, I'm sure the bottom has similar wear, but any boat actually used at least once is going to have this. 2) One turbo fin has a small puncher in the rubber portion of the fin, near where the fin attaches to the mirage drive. I haven't replaced it since it seems to function fine. This is the only damage to the boat. It occurred when I foolishly got pinned down on the lee side of the ICW channel during the 2012 Texas 200. These are tough forgiving boats, and designed for hard play; it would take a real idiot to seriously damage one. Anyway I suspect a replacement fin cost about $30, but I was planning on using an adhesive first if it ever gave me trouble. I purchased the boat new in early 2012, and it has been garage kept except for the times I was able to enjoy it. In 2012 it got used at least a couple days a month, but my work schedule hasn't allowed me to use it once in 2013; that is the primary reason I am selling it (that and garage space). 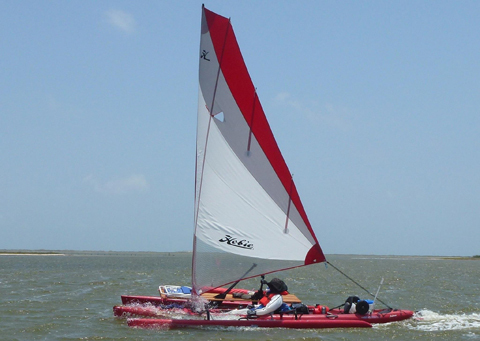 Hobie managed to turn a big kayak into a fast versatile little sailboat, and with high quality components. If there is one thing they could have done to improve the design, it would have been to modify the mold to allow more comfortable sleeping, but that is why I built the wooden deck. Please just serious buyers. You are a serious buyer if you are debating between buying a new Adventure Island vs a used Tandem Island; or if you are debating between buying a new Tandem Island (without a trailer or any accessories) vs a used Tandem Island which already includes a trailer and some valuable extras. [If you are just curious, then your local dealer should be a good place to start. 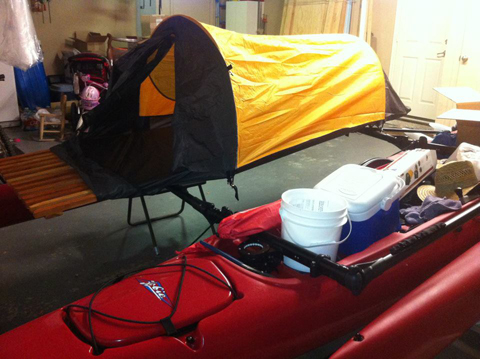 The local dealer in OKC is OKC Kayaks.] I would have loved to have found a deal like this when I was looking, but used TIs aren't that common in my area. So if you are a serious buyer, please email me. After we each determine we aren't scamming each other, we can exchange more contact information. Final comment: This boat package includes enough extras that you could wait a long time before having to spend any more money. The next purchase I was planning on (if I end up keeping it and could find the time to use it) would be a light drysuit (e.g. Kokatat) to extend my sailing season. Last winter I got by with just kayak spray pants and a rain jacket, which worked great actually. SOLD. The boat was sold to a nice gentleman in Tennessee. Your website created a very good response. Thanks for all your help. These boats are all from the same mold, so the Hobie pics, videos, and catalogues let you know what you are getting (specs, looks, etc). Here are links to two youtube videos I made in 2012, which show this boat (which looks and performs just like any other recently made red TI). If you have trouble with the links, type OkieBobby in the youtube search window.